Booking will be confirmed upon receipt of a non-refundable deposit. The balance and a £50 key and breakages deposit will be required 6 weeks before your stay. Any holidays booked within 6 weeks of arrival will require payment in full at the time of booking. Our stunning caravan is situated on Devon Cliffs it features 3 bedrooms, two twin and one double. Bathroom with wc and seperate wc. 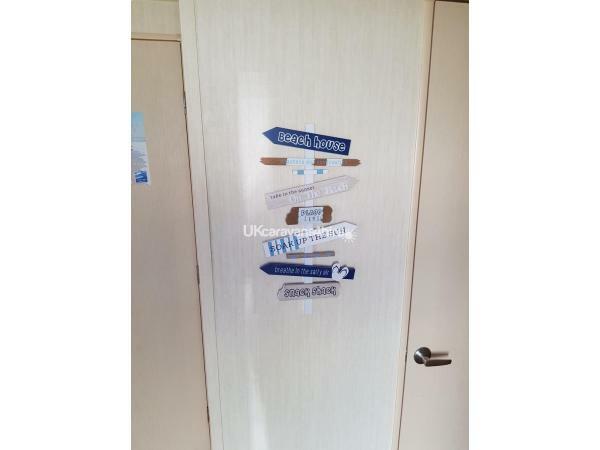 There is a fully equipped kitchen with gas hob, grill and oven, microwave, air fryer and slow cooker, under-counter fridge with freezer compartment, kettle, toaster etc. The open plan living area features a 32" TV with built in Freeview and DVD player. In addition we have added some soft furnishings to help it feel like a home away from home. The caravan has a gas fire in the lounge and benefits from additional electric heaters in the bedrooms and bathroom. We also offer access to wifi. There are some dvds and some games for the youngsters. We have recently fitted retractable stairgates one by the front door and one to seperate thre kitchen from the lounge. Usefull for both dogs and little ones. We also have a travel cot available. The caravan has stunning sea views - opening the blinds to them in the morning always takes my breath away!. Stopped here with my family for a long weekend couldnt of asked for more ,great location well equipped caravan was a great break and highley reccomend . My two boys and I have just returned from an amazing week at Devon cliffs. 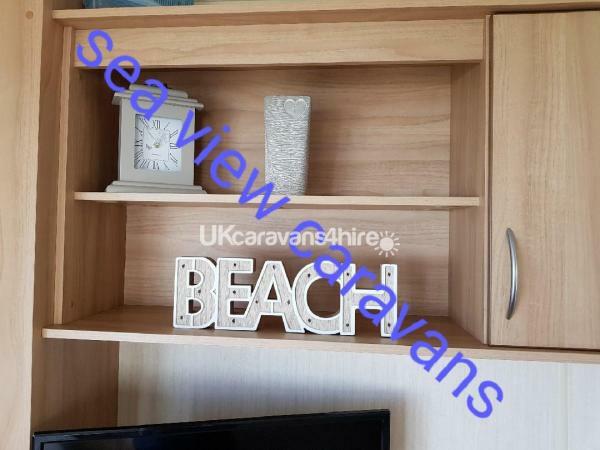 This caravan was perfect, it had everything we needed and was ideally located between the central facilities and the beach. It has a beautiful view out to sea which is the best start to any day. Natalie, the owner responded to all my queries quickly and was a great help. I highly recommend a stay here!